Register Log In Home Forums Trapper Talk Building a cabin? if you ask 10 different people you get 10 different answers. 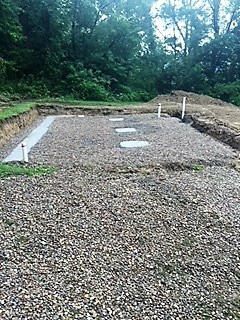 I am wanting to break ground on a 28' x 36' cabin. I have decided to go with a foundation. 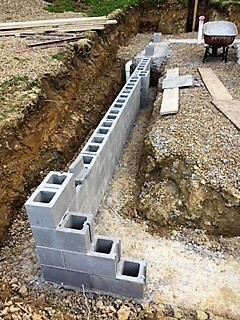 I was not going to have a crawl space, just back fill after block and cement. 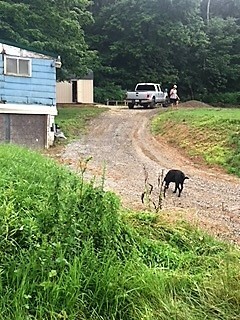 I have two semi retired contractors that will be doing most of the work but I need to guide them to what I want. this is the general slope of where its going and the actual design I want. 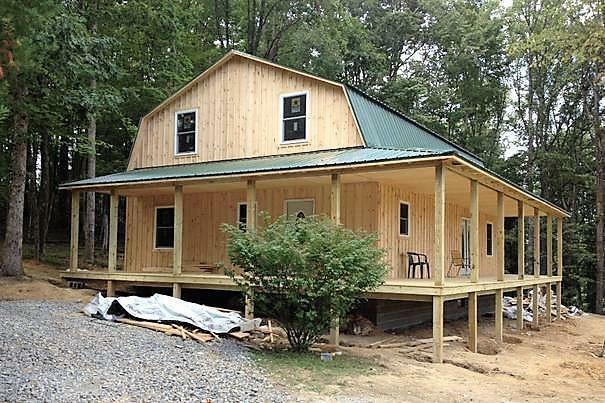 It will have two stories but I want the top floor only 1/2 to 3/4 of the cabin so it overlooks the kitchen, living area. 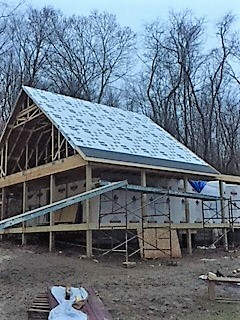 The contractors are trying to talk me out of the gable roof but I like the looks as I think its more cabin/barn looking? If I stay with the gable roof can I lift the top level to have 8' sides so its not shorter with the roof. 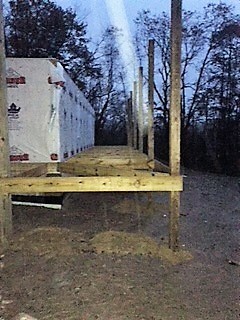 Also, contractors is trying to push putting down floor joists and wood flooring as they say it will be too cold without. 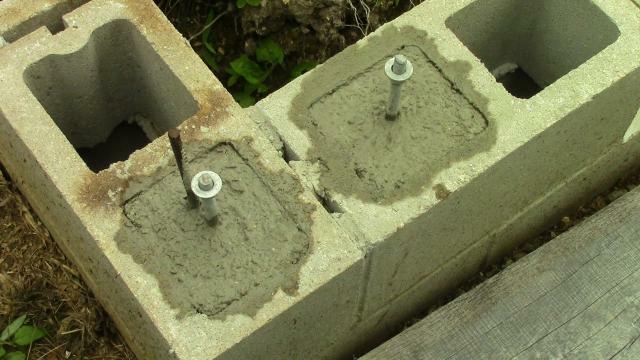 I just don't understand why I'd put down $6000 worth of concrete and still do this? 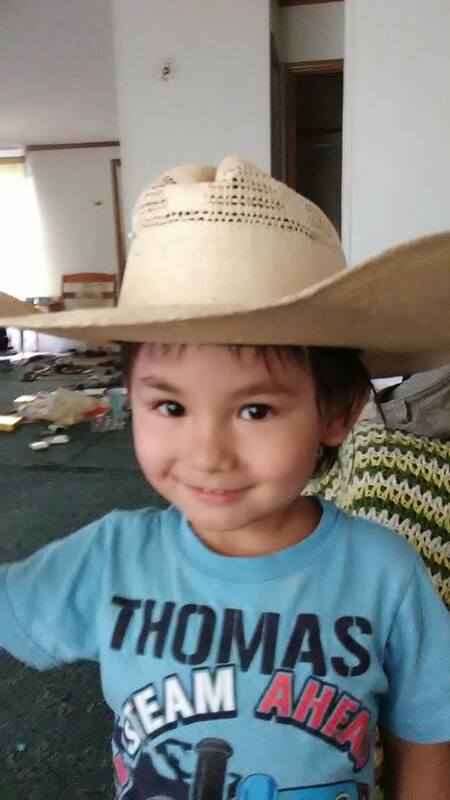 I hope to keep this thread open as I will have lots of questions and like others I'd like to update progress along the way as I thought that was pretty cool. Any advise or pointers would be greatly appreciated. Last edited by bass10; 04/15/18 09:01 AM. The term for that style roof is "gambrel" not gable. It is a good idea to create more usable space on the second floor. 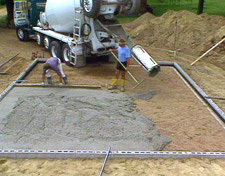 Are you pouring a slab on grade? It doesn't sound like it if you are going to have a crawlspace. 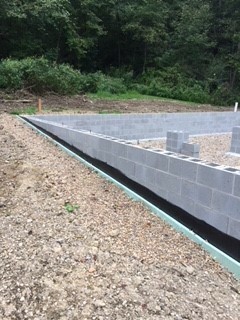 If you are building foundation walls then I agree with your contractors, set floor joists and wood sub-floor. It makes a better job. Looks cool, good luck hope it turns out well!! My Dad was a contractor and did my in-laws place in northern WI. He did a crawl space for the pest factor, and the gain of short headroom storage, the wood floor I think is a must either way. The big advantage to having a crawl space with a wood floor built over it is you can have easy access to all plumbing and other mechanical. I like heat in crawl space that makes the main floor feel warmer. The only thing I don't like about gambrel roofs is they have little ventilation. I'd advise keeping an open mind with your builders. I tend to agree with them on the thoughts you posted, and, many you did not lol. 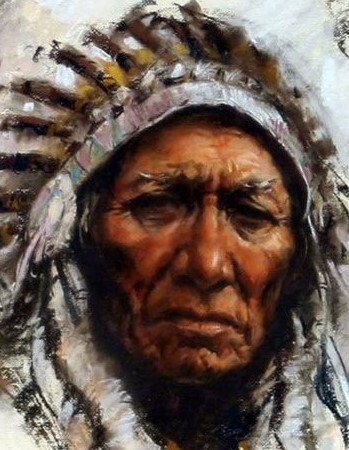 IME, when the inexperienced "guides" the experienced, value vs cost can suffer. Try to communicate your thoughts and ideas and ask why they have theirs. Initial planning is important, and so is all being on the same page. 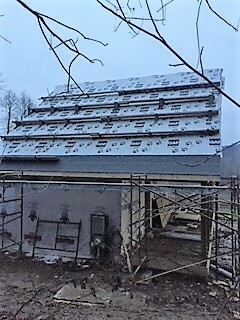 If you build a soffit into them they can be vented the same as a standard gable roof with vented soffit and a ridge vent. You just have to make sure air can flow through the plates at the pitch breaks. 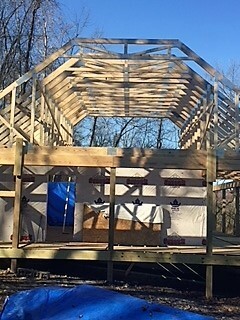 In the pic above the porch would need vented soffit on the part of the roof overhanging the beam, or a couple of vented panels on the porch rafters inside the beam. 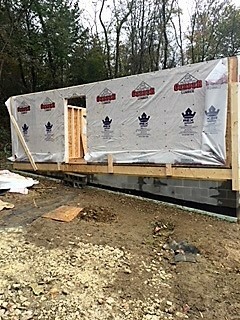 2 leave a crawl space and insulate the walls. 4 do a full basement with full 8 foot ceilings a great place to have a shop , storage , and while it will cost more up front , your building a house larger than the one my family of 5 lives in , it will be worth much much more as a full house with a full basement yet most jurisdictions don't charge taxes for unfinished basement square footage. 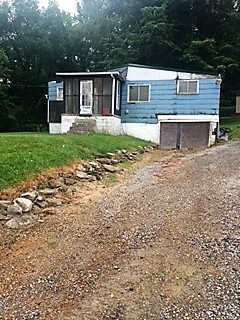 I had a 24x26 garage at my last house with a barn roof like that and a finished room above you give up a bunch of the space to those side walls about 2-3 feet on each side depending on slope and the loss of being able to have windows for light and ventilation the room was 18 x 26 with a cut out for the stairs it had 3 windows in the room they were north south and not east west the way the wind normally blew so even with the windows all open it was hard to catch a breeze. I agree with this option and always recommend it to my customers who are considering crawlspaces. GREENCOUNTYPETE's assessment of this option is spot on and hits many of the points I use to try and convince my customers. I too would go full basement. NEVER seem to have enough storage space. Best way to make a small fortune in business is to start with a large one. 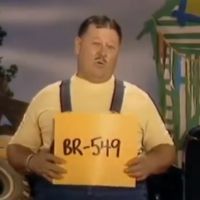 I'm a contractor. You just got some great advise. Be wise and use it. Your contractors will appreciate doing a project done correctly. I don't advise the gambrel roof. Just go up with the second story walls and standard roof. When you get older, that second story is for young people to sleep in. The older you get, the less stair ways you will need or want. Standing seam is nice if you can afford it. Make sure you consider noise from rain. Standing in an un-insulated metal barn in a light sprinkle is surprisingly pretty noisy. 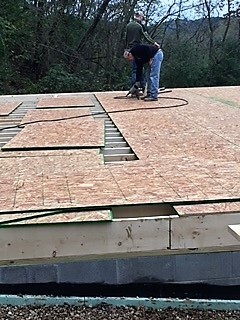 When you add a new standing seam roof they put it over your shingles and it helps with the noise. I don't know how they do standing seam as a new install but something to keep in mind. I built a barn and I wish I would have sat down and spent an hour with the guy just talking trusses up front. I would have went another way. The upstairs of my house has a half wall out the outside like your thinking. Dry walling that short knee wall wasn't exactly 4', and then that joint ties into the 45* portion which also wasn't exactly 4', which ties into another joint at the ceiling. Getting all of that to line up and look right kind of stinks. I tried to cover mine with trim then and it still don't look super great. If I was pouring a floor I spend a few hundred dollars and run pex through it so I would have the option of heating it in the future. I'd also have plenty of conduit and pvc laying there and coming up and capped in the utility room from outside. 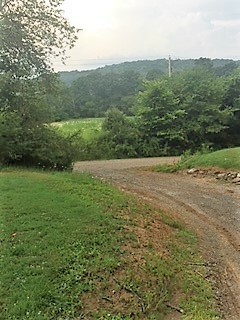 Also if I had a porch like on a slope like that wherever the height was just right I'd have a drive there and a loading dock. Great for delivery's and moving. Depending on whats around you there you might consider a cupola with access from inside facing toward a food plot. Thanks for all the tips guys, still quite overwhelming. I guess I should start at the footer. I DID NOT want a crawl space or basement. I know some said its not much more but this is a second home and watching the $$. I have an out building already up for any work/hobbies. I was thinking this route. 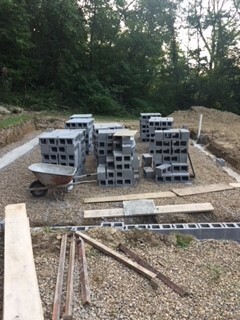 My reasoning for not having a full basement is there is already a 120 year old farmhouse on this property and the basement foundation is one of the reasons I'm tearing it down and building new. Also, with a 28x36 and half the upstairs I am already at 1500 sq.foot which is more than enough for my wife and my second home. I already have a 2600 sq. ft. house with no kids at home anymore. If it's on a slope..........I would consider excavating a bit and put a garage under the first floor. It might not add all that much to the cost. will you be heating it all the time or just when you are there? Well I haven't 100% decided yet but was leaning towards just a wall mount 80,000 propane heater and then having a wood stove for when I'm there. I am there about every weekend but wasn't sure if I wanted to burn through propane all winter when I'm not there? I was going to have very little drywall if any as I know it doesn't hold up to freezing? have you considered since your building into a grade like that,have one the porch on the down grade side and and on on the up hill side, set the hole works into the hill , make the 2nd story have just a few steps down on the uphill side , keep all your mechanicals in the middle of the back and give it it's own heating zone. to keep it at 60 and heat the rest of the house to 45. Last edited by GREENCOUNTYPETE; 04/16/18 01:14 PM. of break ins. They could sit back there for hours and nobody could see them, plus the beautiful view of the hills is on the front. I am not familiar with pex but will look into it. There is no natural gas options there. I was actually going to go with metal sides and am not sure what will be the best way to insulate it. 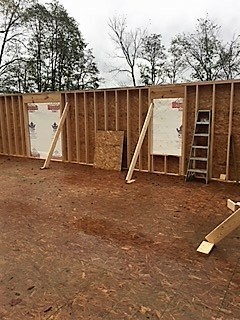 I haven't gotten that far to see if I can put the metal right to the framing then insulate (spray or otherwise) up to the metal or if I need sheeting. I will probably use knotty pine for the interior walls? 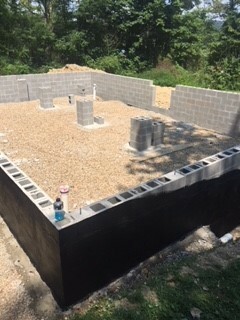 So to back track do you agree with my foundation choice but you're saying run pex thru it to heat it? 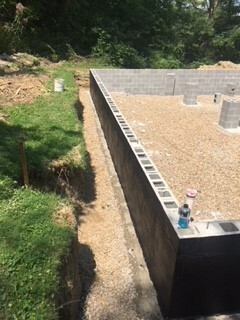 I think you should price it as a crawl space , basement without finished floor, basement with a finished floor and as a foundation with poured concrete floor. but any option that involves concrete floor should have PEX tubing in the cement it is such a good way to heat for very little cost you heat up the cement and you have many tons of thermal mass to hold the heat you still have to do everything else you would do with a concrete floor just that for a few hundred dollars in tubing your running the heat through the part of the house you would never get warm otherwise. cement floors are always hard on joints and to stand on hard to hit if you fall but at least if it is warm concrete from heating lines running through , it won't also be cold all the time. 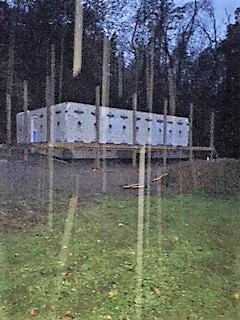 when you have a building not heated , then you start heating it a lot of time the floor will start to sweat especially if you don't have insulation and vapor barrier under it , it will always be cold and no matter how warm you make the air it never really warms up the concrete floor. I have stayed in older slab cabins in the winter , furnace can run all night the floor never gets warm and it often sweats because it was allowed to get down to freezing for days or weeks before we got there and started the heat. 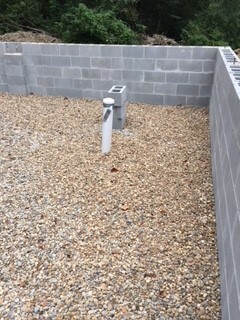 if you move the slab down 6 feet into the ground it changes things you don't have frost at the floor , you stay cool but warmer than outside I take a laser thermometer if I start it the top of the cinder block wall where it is expose to the outside , we have snow right now the wall is 51.5* as I move it down the wall the temp climbs about a degree every 16 inches the floor in the middle of the room is 58.5 mid summer it won't get over 62 my house is more than 100 years old and the basement has no insulation but it shows this effect well. 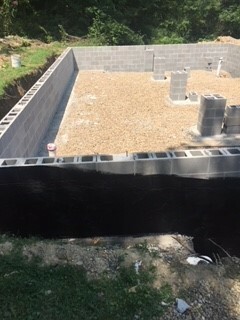 you have to isolate it with insulation around the insides of your foundation wall and under the slab that gets expensive , concrete is expensive so a craw space with a vapor barrier and some gravel over the top then a wood sub floor puts the least expensive of all insulation between the ground and your floor , dead air space. it used to be you vented a crawl space , now you seal them up and insulate the perimeter. knotty pine looks nice , but the cost is more than double even a basement board drywall that handles moisture and temperature swings better. how about running water and septic will this have water and septic , how will you run that , where will the water shutoff be . how will you drain the house if your not heating it , what kind of water heater , will you be draining it every use of the house ? am I understanding that the view is on the uphill and not down hill side ? 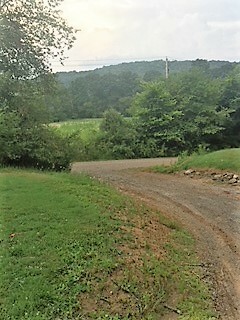 View is on the downhill. I would go with a slab (heated) over a crawl space. So many crawl spaces with mold and dry rot. You will either have to drain or heat in freezing weather. If a pipe breaks in a concrete floor good luck finding the break. A crawl done right gives many options a slab doesn't. 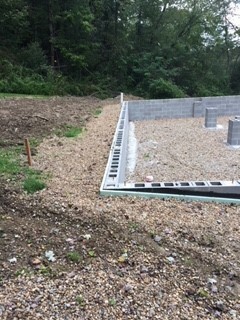 I am a builder and although I don't know your situation I do know that you need to trust your builders opinion or get a new one. I have told customer that I would not do things a certain way if I knew it was not right. Some time it is not right or wrong but rather preference just like which trap or lure you choose. Good luck. You will either have to drain or heat in freezing weather. If a pipe breaks in a concrete floor good luck finding the break. Another option is to add glycol to the in-floor radiant heat system. Well its been frustrating but finally am off and running, lots of planning and a bit overwhelming. Last edited by bass10; 07/25/18 10:22 AM. 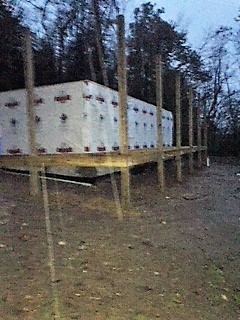 Got the footer started Saturday, hope they finish up by Wednesday. Then I will put in pipes for drainage, vapor barrier and a scratch coat. Then off to building. Very exciting and overwhelming as well and the costs are already adding up and going over of course. 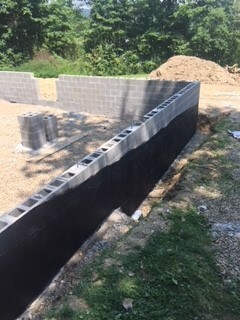 You can insulate the floor slab from the outside ground with thick styrafoam all around the sides and down into the ground a couple feet. 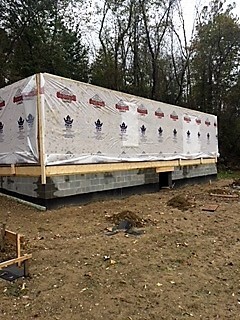 Some insulation under the slab would help, not sure about the cost then.Floor joists and wood floor are going to be warmer, but also expensive. Like others have said , it makes a difference if it is going to be heated every day or only on weekends, etc. A little heat on the slab to keep it warm would help rather than allow it to equalize with outdoor cold, then have to be re heated. But that is going to cost too. Kyt, yes I am running greenboard insulation on the outside and inside the foundation all the way down to the footer. Lots of options and they all cost money. 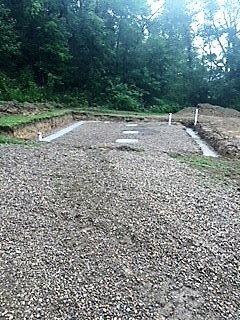 Here are some pics of the foundation being done. I filled some of the block with morter for strength and tar for the outside. 90 degrees this weekend, those two things about killed me. What a job by myself. My dad told me if you have 10 good friends and family that say call anytime they would love to come down and help you will be lucky to get one. Boy is he right. Now come October first they will all be down every weekend to hunt. Last edited by bass10; 08/06/18 10:53 AM. Looks great! Beautiful place how big of spread is it? Are you working on it full time also besides the two contractors? Snowy, it is 26' X 38' and even though its a hunting, fishing, trapping, retirement cabin I'm already wishing I had made it bigger. But with a tight budget I just couldn't afford to. 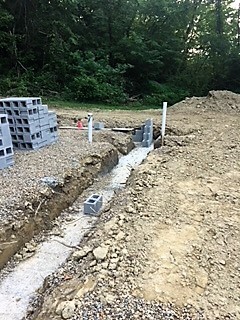 I had the footer and foundation work subbed out. I am going to do all I can myself but I am not a builder. I work a full time graphics/printing company and this is an hour away so it'll take awhile. One of my two semi retired contractors is already bulking a bit so I may have to go another route to get it under roof by winter. work. 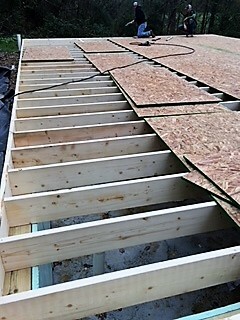 That should clear the way for floor joists and walls to be started. And I had a guy help with finalizing plans and this thing took a big turn from when I started but I think I'll be much happier. 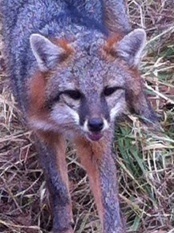 Have to push a little to get it under roof by winter so I can focus on trapping and hunting. Well guys its been awhile since I updated. Its been a long grueling process and of course going way over budget. 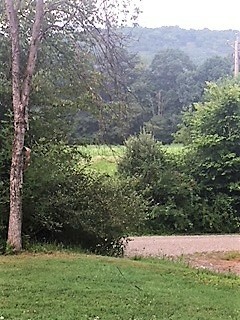 The rain has been brutal here in Ohio and Jefferson County has registered the most rain fall in September in 65 years, October not any better. That and only getting a day or two a week has been slow going. 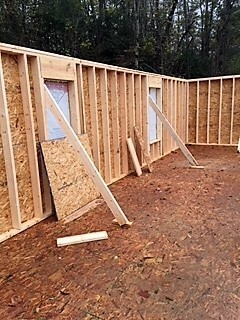 Hoping to get the headers and start the truss work this week. 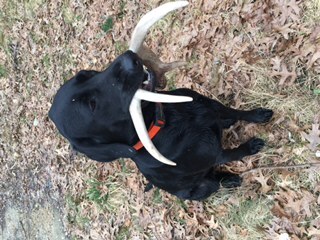 Of course sacrificing my deer hunting, namely the rut is tough on me also but really want to get under roof asap. Last edited by bass10; 10/29/18 09:13 AM. Looks great.. Keep plugging away..
Looks good. I hope that you get the roof on soon. I like it. That is just about perfect. If you don't mind me asking, where did you get the plans for that ?? 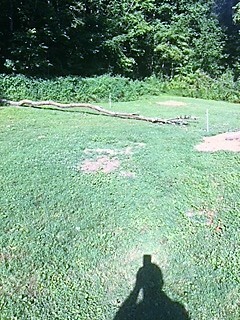 Yeh, the weather has been terrible and only getting a couple days a week to work on it has been tough. 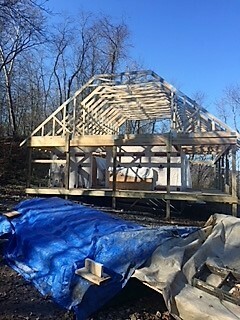 I am off tomorrow and really hoping to get the trusses up this weekend? Of course I have a wedding to go to Saturday at 4:00 that is pretty important and of course its the rut here also? Scuba, I changed the plans from the first page. 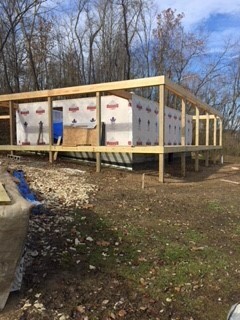 My buddy has been building houses for 35 years helped me with the plans. 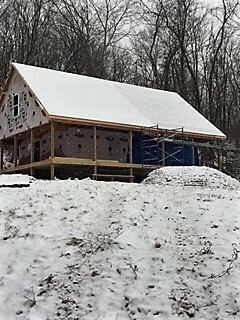 It is really going to be sweet but the roof will now go over the porch all the way around. He was not a fan of the gambrel design. Didn't like the snow and rain free falling below. 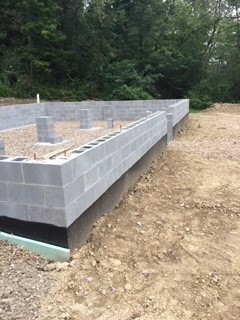 It also changed to a 26X38, 988 square feet on the main floor and with his truss design it will have 2 bedrooms and a bath on the upstairs with approx. 670 sq. foot. 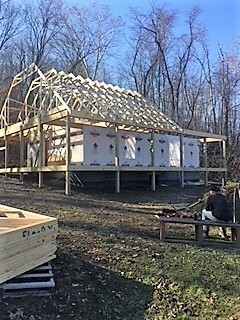 The trusses will go about 3/4 of the way then I'll have a cathedral design overlooking kitchen and living.Great design but he does things 100% and he definitely didn't consider what my wallet would hold. After I get roof on and you see it I'd gladly share my plans on here. My workshop has a Gambrel roof- a shed dormer really opens up the space on the 2nd story. 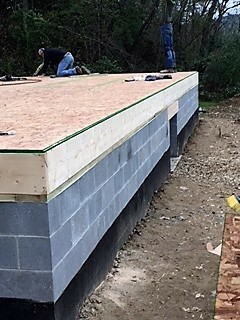 If you create knee walls on the second story roof slope walls, easy to vent to a soffit and easy to insulate. of money fast. I'll be glad when its under roof and I can stop the bleeding a bit. Do what I can when I can on the inside. Last edited by bass10; 11/12/18 05:11 PM. Thanks all, been a real learning experience and a true labor of love, just hope I can finish it and enjoy it but the money train as well as my wifes patience is running out and its still early in the game. a 10-12 pitch so its a bit tough but needed that pitch to have 2 bedrooms and a bath upstairs. It is a 8'8" (roughly) ceiling to accommodate my son who is 6'8". Last edited by bass10; 12/04/18 04:19 PM. work than I imagined but staying with it and can't wait till the next thing in line to do. Last edited by bass10; 01/14/19 03:24 PM. All I can say is WOW, just wow! That's awesome, loved reading this thread! Can't wait for the next installment. A great thread giving me ideas for my build starting sometime this year. Beautiful! Looks like a lot more then a cabin. Please keep us posted on your progress.